It's still hard to fully comprehend, isn't it? And yet it really did happen at Monza last weekend. The team we used to know as Minardi won a race, with a car driven by a guy who only turned 21 in July, and who has just over a season of Formula One racing behind him. 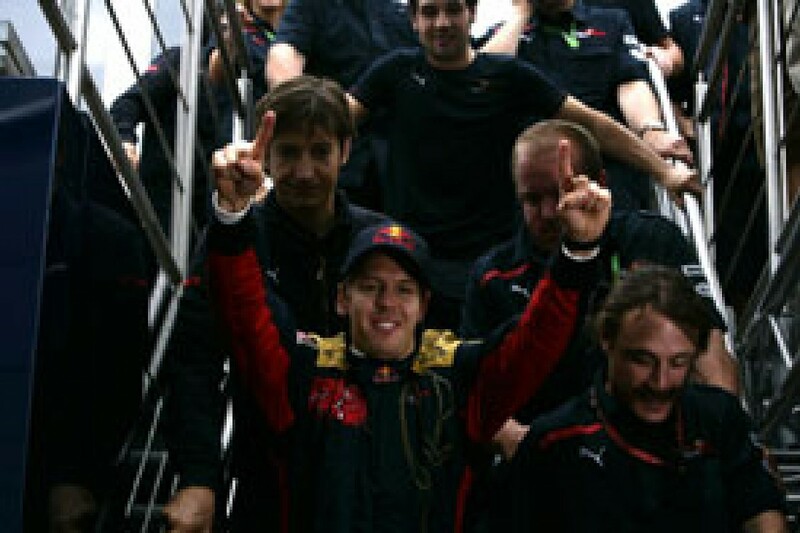 His first win, and the team's, was also their first podium finish. But this wasn't some fluke, someone benefiting from the top guys blowing up or spinning off, or a unique strategy gamble that happened to pay-off. Yes, it rained in qualifying, and it rained for the race. But Sebastian Vettel and Scuderia Toro Rosso simply did a better job than anyone else in the difficult circumstances, and won from the front in crushing style. The win was there for the taking by anyone who took the trouble to get things just right. It was hard for McLaren and Ferrari to accept that they'd let this one slip away, harder still for teams such as Toyota, Nick Heidfeld and Mark Webber to take it in, since a precious win still eludes each of them after so many years of trying. Even Vettel could barely take it in: "Obviously you cannot be much better than that. It was unbelievable what happened today. I'm extremely happy. I think it will take some time to understand first of all what happened yesterday, and even better what happened today..."
Pole, 49 of 53 laps in the lead, victory by 12.5s over a healthy McLaren that ran a very similar pit strategy - and yet Vettel registered only the 14th fastest lap. This was an unusual race. So how did Vettel do it? Toro Rosso's move towards the sharp-end of the field has been evident since the STR3 was introduced in Monaco. When the team began to edge ahead of the sister Red Bull outfit, people wondered, how much of this was about the Ferrari engine? Much, has been made of the 30bhp discrepancy between the Renault and Ferrari engines in the two cars, and that became increasingly evident after Hockenheim, where STR was apparently upgraded from customer to works spec power supply - Maranello having homologated two types of engine. In Valencia, Vettel was quickest in the Friday morning session, and he qualified and finished sixth, albeit some 52s down on winner Massa. At Spa he was eighth, seventh and sixth in the three practice sessions, and a slightly disappointed tenth on the grid. He finished fifth after doing better than most on dry tyres over those final wet laps. Incidentally Sebastien Bourdais was quickest in Q1, so for two races running, a Toro Rosso had actually topped a session. 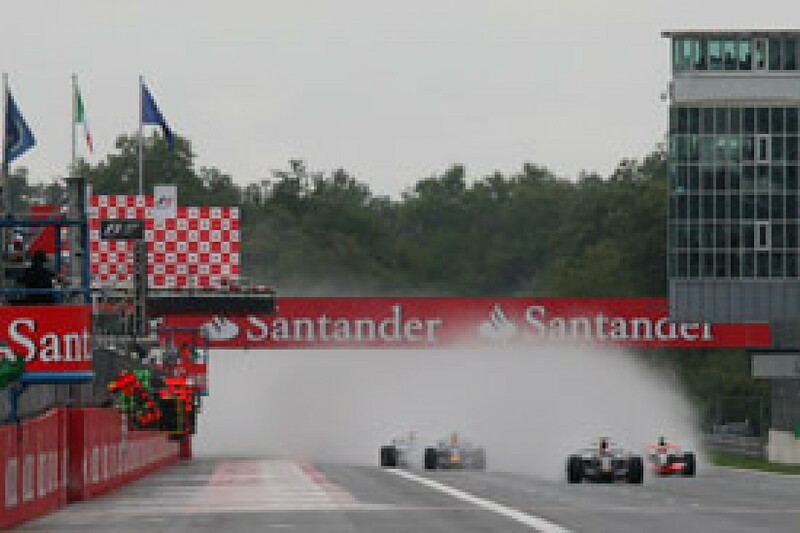 The team had high hopes for Monza, especially when it became clear that it would be a wet weekend. But things got off to a modest start on Friday, at least on paper. Vettel was only tenth in the damp morning session, nearly 5s off pacesetter Adrian Sutil, and most of those behind him didn't do a competitive lap. He maintained that position in the dry in the afternoon, this time only 0.9s off the quickest time of Kimi Raikkonen. That looked more promising, but again he was behind a Force India, and no clear pattern had yet emerged, with some quick guys still near the back. In fact Vettel wasn't very happy with the car, and it took changes for Saturday morning before he was really in the groove. 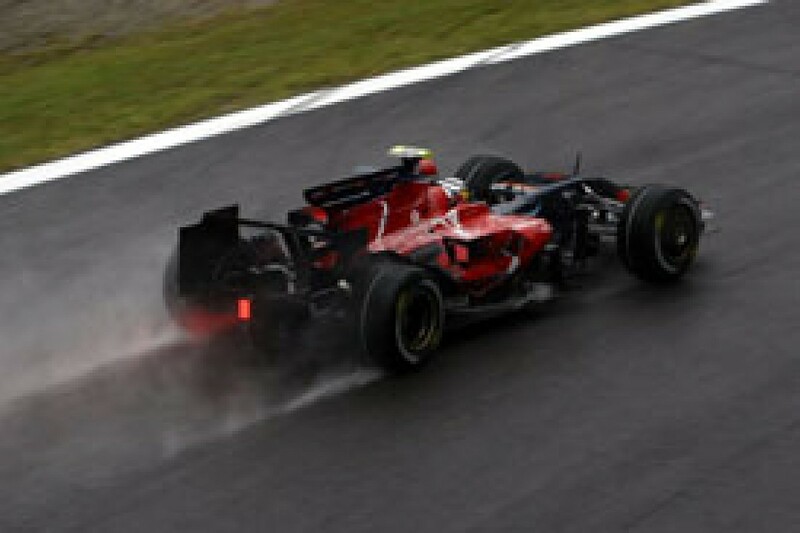 In that wet session he was second only to Timo Glock. Nevertheless, with conditions changing over that hour and the McLarens and Raikkonen only making a token effort, few would have bet on an STR pole. After all, Bourdais was down in 17th. However, Vettel had other plans. "I think the key was that I had a very good confidence in the car," he explained later. "On Friday I didn't feel well in these conditions, but overnight we did some changes, and in the morning it was much, much better, so I was pretty confident going into qualifying." Vettel and his team did an amazing job come qualifying, making all the right calls and being out on track at just the right time. In Q1 he was third, behind only the two McLarens, while Bourdais was sixth. Then in Q2 the blue and red cars were first and fifth. Forget the unknown parameters of practice, at this point everyone was going for it on equal terms with low fuel, and it was all about pure driver ability and a perfect package of chassis and tyres for the conditions. Those who made it through to Q3 had some tough calls to make. Rain was predicted for Sunday, so what to do? Logic suggested a heavy fuel load to give the maximum range in the race and a greater chance of being in the right window for a tyre change, in whatever direction might be necessary. Others thought about a shorter first stint that would get them nearer to the front of the grid, and allow them to switch between one and two stops, as circumstances allowed. STR thought about one thing - we want to be quickest. The race was to prove that, give or take the odd driver stopping a lap early to cover the possibility safety car, Vettel was fuelled four laps lighter than anybody else. At the time the team had no way of knowing what the opposition might do, and that probably didn't matter too much anyway. They just went as light as they dared. It worked. In fact just one lap extra in Vettel's tank, or one lap less in Kovalainen's, would almost certainly have ceded pole to the Finn. But even if he'd been as heavy as his closest opposition, Seb probably would still have been second. Given that such as Robert Kubica, Lewis Hamilton and Kimi Raikkonen all had spectacular moments at the Ascari chicane, finding that speed was an amazing performance. "I was joking with my engineers earlier on," said Vettel after qualifying. "When it rains, we have to go for pole position. After free practice I felt very, very confident in the car in these conditions. And I said we have to push, we have to go for pole position. It was a dream, and it was a dream coming true. "When I crossed the line I didn't know yet that it was a good enough for pole position. It was a thrilling session to the end. I had a very good lap in the beginning, and then towards the end I had a lot of traffic and poor visibility, so I could not improve my time, and on top of that, it started to rain again. So it was very difficult throughout all the sessions, no matter which one. "The conditions were really difficult, but I think we had a very good run plan. The car was very solid to drive, I felt very confident in the car. The result is obviously better than we all could expect. "I think everybody was behaving extremely well in qualifying, it was very, very tricky conditions. It's very difficult because when there's aquaplaning there's not much you can do. All through the circuit there was like a railway, you had to put the left hand side or right hand side of the car, if you were leaving that or just overshooting by a bit then the car was aquaplaning straight away, so you had a big risk to lose the car. So it was very, very difficult." STR's good straightline speed was very obvious: "I think it depends on how much wing you have! It's not that as some people might expect we were on a full wet setup, and we took the gamble. It's not the gamble. It's not like we are mega light or anything. We deserve to be on pole, we did a good team effort as well. Looking at the other car, I think Sebastien just missed third place by a bit." Others may have looked at the times and muttered about Vettel being unrealistically light, but they missed the point. Pole at Monza last weekend was arguably even more valuable than pole at Monaco, and STR and Vettel had realised that. They couldn't know for sure that the race would start behind the safety car, but when that was confirmed by the FIA just five minutes before the start, it came as a massive bonus. Under normal circumstances Vettel risked being swallowed up, or maybe tapped from behind, into the first chicane. With a safety car he could just boot it when the track went green, knowing that Kovalainen and everyone else would be stuck in a cloud of spray behind. Unless he made a silly mistake, he could be pretty sure of getting out of the chicane in front, a clear track ahead. We can only guess at how tough it was for everyone bar Vettel when the green flew at the end of two slow laps, although the onboard cameras gave some indication. Indeed crossing the start/finish line, Hamilton had dropped an amazing 3.1s back from Raikkonen, presumably in an attempt to give himself some breathing space. "It was a very, very difficult race, very, very tricky conditions out there," admitted Vettel. "A lot of spray in the beginning. Being first is the easiest position you can be, but I've been there, I've done all that, where you go half-throttle down the straight without seeing anything..."
Vettel really went for it over those opening laps - the gap to Kovalainen grew 2.0s on the first lap, then 3.7s, 5.2s, 5.8s, 5.7s, 6.3s. By then Kovalainen was clear of the worst of the spray, but he obviously didn't have the supreme confidence that Vettel had. In fact on that last lap Seb had scared himself by going wide over the second chicane, and while he actually gained time, his progress slowed slightly for a while, before he began to edge clear again. "I knew that I would possibly stop earlier than the others, so I knew that I had to pull a gap as big as I could. I was pushing very, very hard every single lap, and sometimes I was close to losing it, but I think that's the way you have to do the race. I was pushing throughout the whole race." Of course, Kovalainen wasn't the only man he was measuring himself against. The conditions also gave Vettel a huge advantage over the jokers in the pack, as quicker drivers found themselves trapped. After 10 laps, he was 18s clear of Felipe Massa in sixth, and over 34s clear of the Raikkonen/Hamilton battle. The lighter fuel load, which others had perhaps scoffed at, also contributed to his speed. On lap 17, Vettel was 11s clear of Kovalainen, and crucially 33s ahead of fifth-placed Nico Rosberg - the man the team had surmised was the quickest of the one-stoppers. Crucially, that was more than enough to ensure that when he pitted a lap later, Vettel emerged still in front of the Williams. "It was always difficult," he said. "I mean I was not thinking of winning the race straight from the beginning. I was trying to push as hard as I can. It was very decisive to get out of the pits ahead of the one-stoppers, [of which the quickest] at that point I think was Nico." 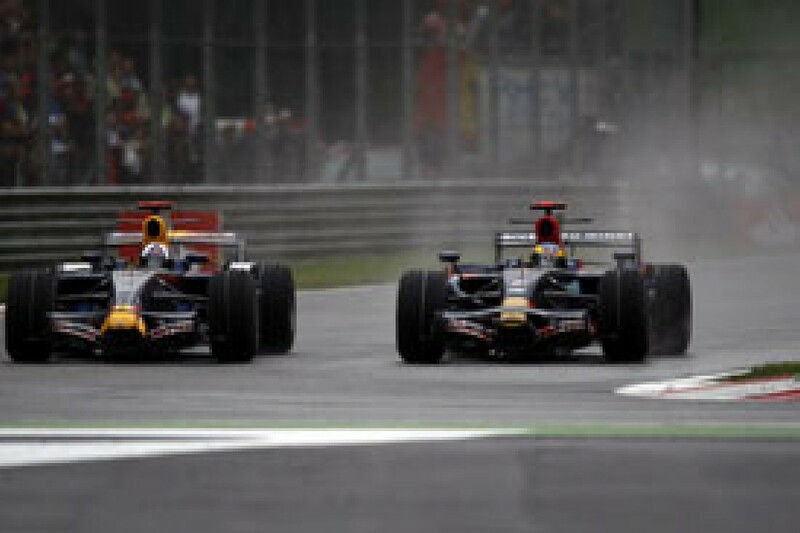 Kovalainen, Webber and Massa all briefly moved ahead, and it was now a question of when they would stop. All three came in together on lap 22, and Vettel reclaimed his lead. That put them out of the equation for the time being, but now there was the matter of the one-stoppers. With considerably lighter fuel loads than Vettel was now carrying, and with their original sets of tyres seemingly well suited to the conditions, Rosberg and Hamilton closed in. Indeed, on lap 26, Lewis was just 1.1s behind and looking for a way to pass - but at the end of the next lap, he pitted. The Briton went to extremes of course, and having been burned in qualifying by going too early to inters, he didn't want to make the same mistake. He was only a lap or two off being able to make that choice without serious risk. The Hondas were already out on inters, but with their normal tardy pace, it was hard to judge what effect the tyres were having, and the FIA forecasts had promised more rain. On lap 28 Rosberg went to extremes, but David Coulthard went for inters. Then on lap 29, Heidfeld went onto inters, followed by Fernando Alonso. Soon everyone was coming in. For Heidfeld, Alonso and Kubica the timing was perfect, as the change coincided with their single stops, and they were repaid with big points. It was a disaster for such as Hamilton and Rosberg, whose single stops had been just a shade too early, and who now needed that extra pit visit. It was just about okay for Massa and Kovalainen, whose two-stop schedules dovetailed with the changing conditions. And it was absolutely perfect for Vettel, who stayed out as long as possible, making use of his declining fuel load and covering what everyone else was doing before going to inters on lap 36. Along with Hamilton and Piquet, who came in that lap, he was the last to make the change. "Every lap I was pushing harder and harder, fighting against myself, just trying to keep the gap as big as possible, and increase it," explained Vettel. "It was never easy, especially when we were on extreme wet tyres, there was less and less water, everybody was looking for some water to cool down the tyres. It was getting very, very slippery, very tricky. "Later with the inters in the last stint there was kind of a dry line in some corners, but being 50cm or just a bit out of this dry line you lost the car, and that could have been it. You always had to keep up the concentration." The team did its bit by not disturbing him, as team principal Franz Tost noted: "It was quiet because he was driving well. He did very fast lap times, and you would disturb a driver just telling him drive slow or drive different. Just let him go. He was experienced enough to bring it home." Seb made it look easy, but it wasn't: "You are always on the edge, and that's just great. In the end I didn't drink anything. I was so thrilled and I enjoyed the race so much, I totally forgot to drink. So in the last couple of laps I tried to drink something, but at that time the taste wasn't as good anymore! Fortunately I only had some laps to go. "Towards the end I thought sometimes damn, if there's still this P1 on the pit board, we are going to win the race! It was difficult to understand, but then I tried to stay focussed. With the conditions it was difficult, being a bit offline you lost the car, so it was very tricky. In the end, seeing the chequered flag, I didn't know what to say. I waited for the team to make the first call on the radio." With the track drying by the lap, inevitably everyone set their fastest laps right at the end. Even Seb did his personal best on lap 53, although he had no need to go too quickly. Still, it dropped him down to 14th in the overall list - a strange statistical anomaly at the end of a perfect race. Over those last 16 laps after his second stop his lead on Kovalainen went from 9.5s up to 14.2s, and back down to 12.5s at the end. Vettel's sheer joy afterwards was extremely refreshing: "It's difficult to describe. When I crossed the chequered flag I didn't know what to think about, and I hardly realised what had happened. Then I did the last lap coming back to the pits, all the tifosi standing up, shouting, screaming, it was so special. It was probably the slowest lap I ever did in Monza, but it was the nicest one. "Obviously it was my first podium, so I have no other races to compare it to. But it was unbelievable, standing there and seeing the crowds, a lot of people running down the straight, everyone cheering and shouting. Winning here for an Italian team is probably the best that can happen to you as a driver. Listening to the Italian national anthem was unbelievable."